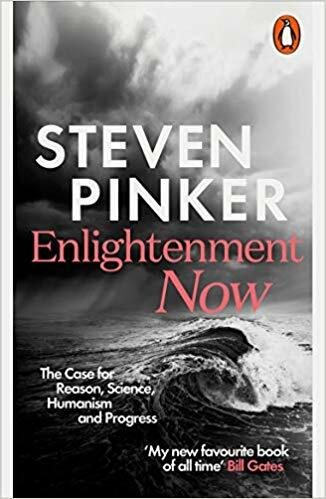 I’ve just finished Steven Pinker’s Enlightenment Now. It’s a thoroughly bracing read – bracing in the sense that you sometimes feel that you’re having buckets of cold water thrown over you, but also that you emerge as, well, a more enlightened person: inevitably better informed but also better equipped to defend the values of inquiry, evidence and rationality that are so often missing in today’s discussions (cf Brexit passim). Pinker’s basic approach on any given issue is to beat you about the head with data, but to do it in such an accessible and stylishly written way that it’s mostly a pleasure as well as a lesson. He covers an implausibly wide range of issues, from peace through the environment, health and terrorism to quality of life and happiness. It’s not just a defence of the enlightenment principle of using reason and sympathy to enhance human flourishing; it’s a positive affirmation of the extraordinary progress w’ve made by applying reason and science, and a reminder of how bloody lucky most of us are to be living now. Occasionally he lets his commitment to counting (ie quantitative evidence) occlude other types of evidence, and deals only superficially with the interaction between them. But he points out again and again just how much progress we have made, in a longer but not unrealistic perspective. And the writing is full of pertinent illustration and sharp comment – for example, he contrasts petty complaints about delays to flights with the (almost literally) incredible experience of sitting in an armchair hurtling through the air to arrive in distant lands just a few hours later. And he points out that a climate of declinism is fertile ground for authoritarian populism to feed off (cf Brexit again). no law of complex systems that says that intelligent agents must turn into ruthless conquistadors. Indeed, we know of one highly advanced form of intelligence that evolved without this defect. They’re called women. Sadly he doesn’t push this line of thinking further. It would be good to know what Pinker, with his unquenchable rationality, thinks might be different in the way systems are designed, and societies and organisations managed, if that ‘advanced form of intelligence’ had a greater say. You don’t have to subscribe to essentially gendered thought processes to raise the issue. I wonder how Pinker would go about counting the value of the different competences that women bring to the party.